Last time I uploaded a post, I showed you the first piece of a board I am painting that will be mostly used for Horus Heresy games. In this post I will be showing you the next piece of the board. I had a lot of fun painting this, not only because the tile is so detailed and such, but because it came with a small personal challenge. 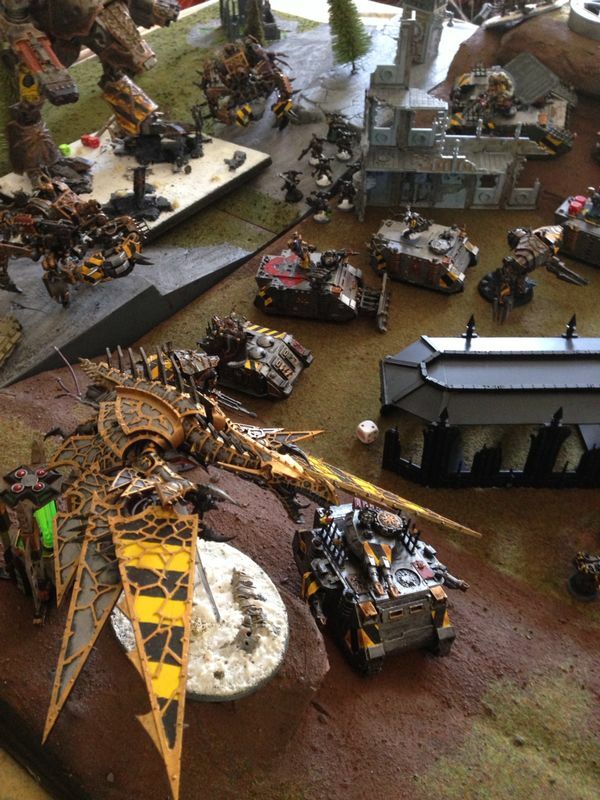 The surface of this board would have to be painted in the same way as the crashed Thunderhawk so that both tiles could be laid next to eachother and not see any difference in shade, texture and such. And I am very pleased to say that it worked out very well. 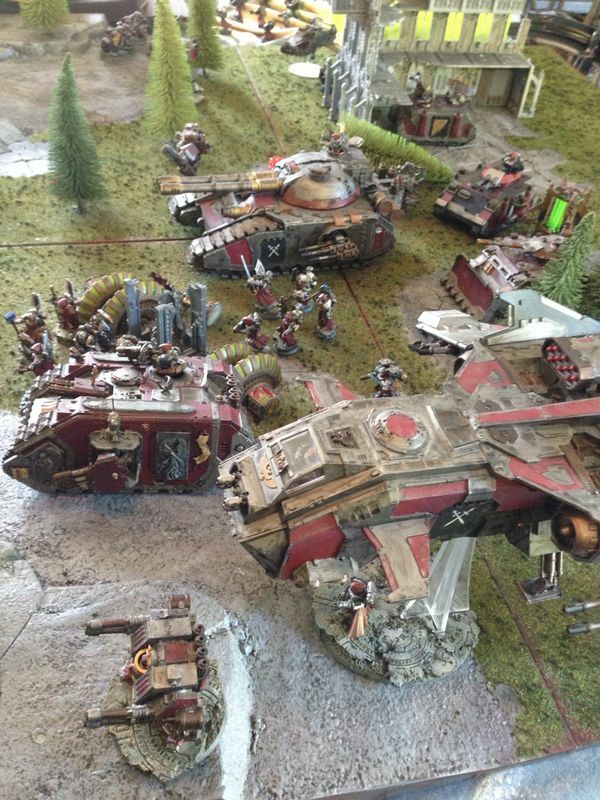 The piece I am talking about is the Primus Redoubt, redubbed the Iron Redoubt to stay in theme. 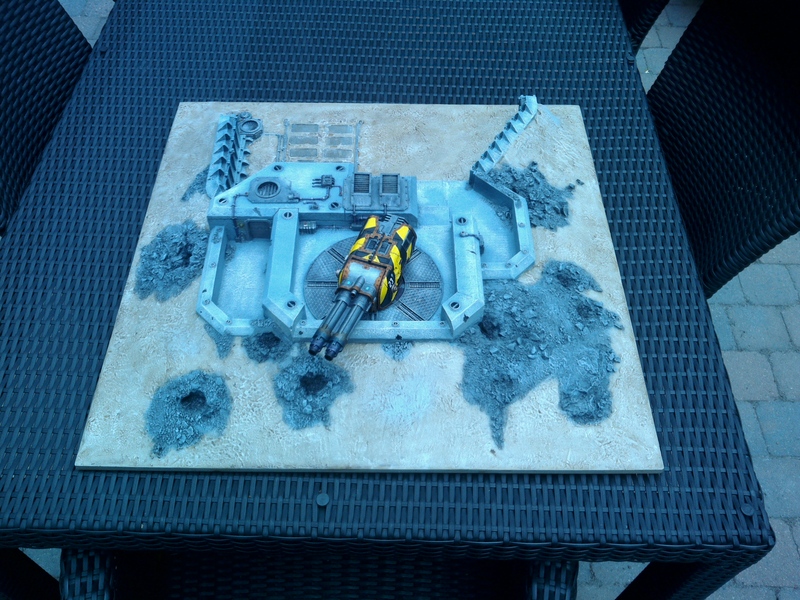 The surface of the board is, explained, painted in the same theme as the crashed Thunderhawk tile, a desert styled environment. I knew I wanted the bunker itself to be a medium light grey so it could be drybrushed with a light grey so I could give all the edges and detail some extra attention. And don’t think the bunker is just some straight-on, flat surface, because when you would look at the bunker closely, you can easily see the very concrete-like look it has. This tile has something more than the CT tile, which is a certain amount of craters and piles of rubble. These were painted in a medium grey, washed with black shade and drybrushed with a lighter grey but leaving the inside of the craters untouched, giving the idea that the inside is where the missile/projectile has exploded and the ground has not recovered from it since. All the metal on the board, like gantries, ventilator shafts and such, were painted in a medium iron metallic, washed blue and drybrushed again with the medium iron metallic, then a soft drybrush of light iron metallic to add more chipping effect to it. Ultimately, the entire bunker was then drybrushed with a very light sandcolor drybrush paint on places whereyou could imagine the wind would have swept up sand and landed on the bunker itself, so mainly the outside of the bunker close to the ground and here and there some patches on the inside, to help give it a nice weathered look, like it’s already been there for a while. And then there is the ”eyecatcher” of the redoubt, the Double-Barrelled Destructor Cannon. This one is very similar to the one you would find on a Legion Falchion, so very cool. I painted it in the colors of the Iron Warriors Legion. 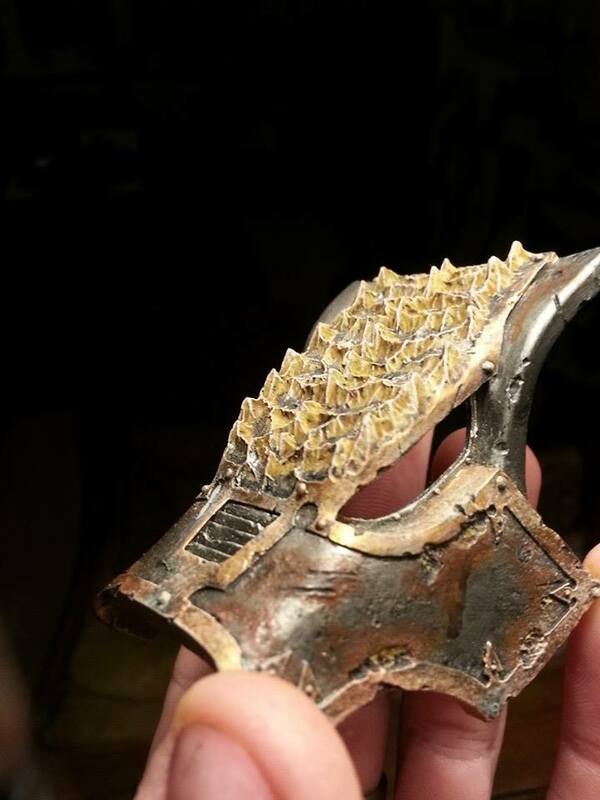 First painted it in a medium metallic iron, the washed the entire thing blue and drybrushed it back in iron, giving it a nice, cold metal kind of look. 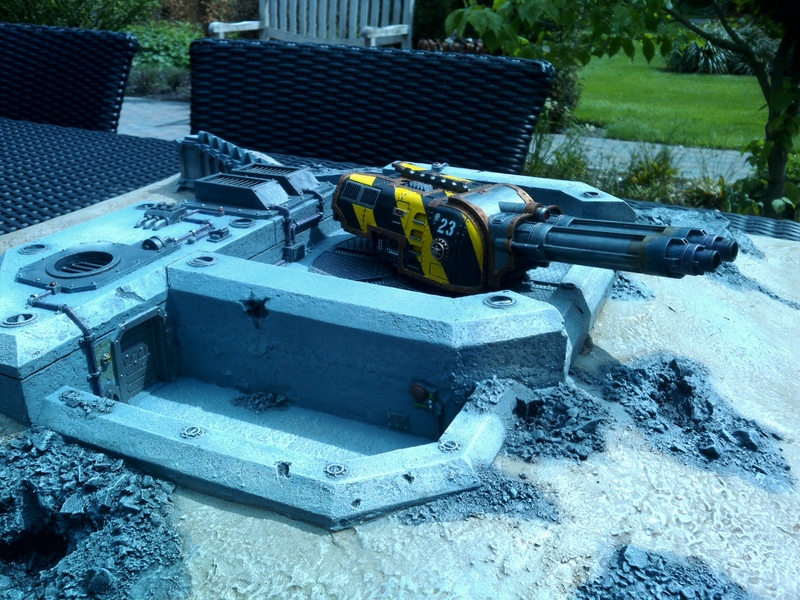 Then, I painted the black and yellow hazard stripes on the major ”hull” so it would really stand out from the bunker. Next painted all the small details like computer and stairs on the side in the same medium metallic iron and, using GW’s glazes and tamiya clear colors, painted the screens themselves in the colors of my desire. Then, I painted the trims in a brass color, washing them with a sepia multiple times untill it was the shade I wnted it to be. This gives it a real nice weathered, old look. Then ultimately, when the entire cannon was completely painted, the last thing to do was decals. I found an old sheet of GW’s Chaos Space Marines decals and took the Iron Warriors emblem from it twice, one for each side. I applied it using Humbrol’s decalfix. 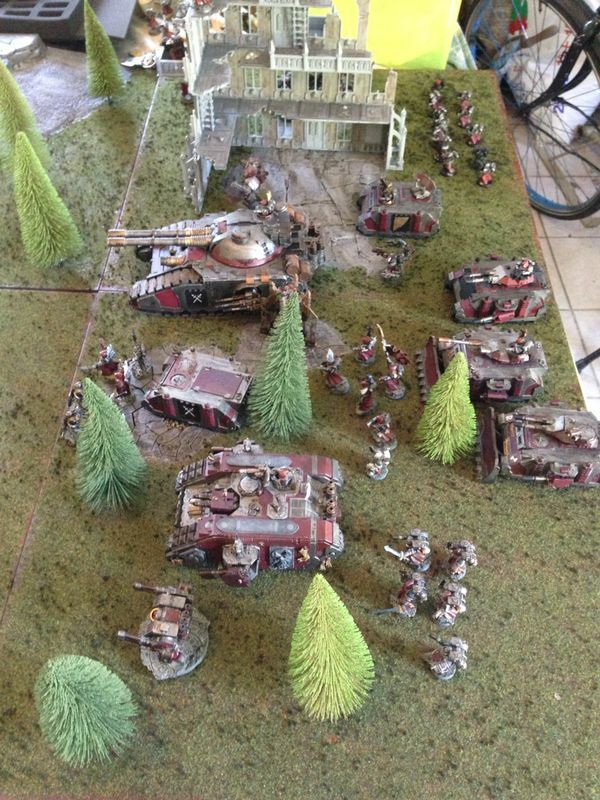 Then I took a decalsheet from the Imperial Guard Baneblade set and cut out the number 23. This alsonwas applied using decalfix. After that was dry, I used a brush and a small amount of black paint and covered the edges of the decals, blending it in completely to the model, no edges visible anymore. 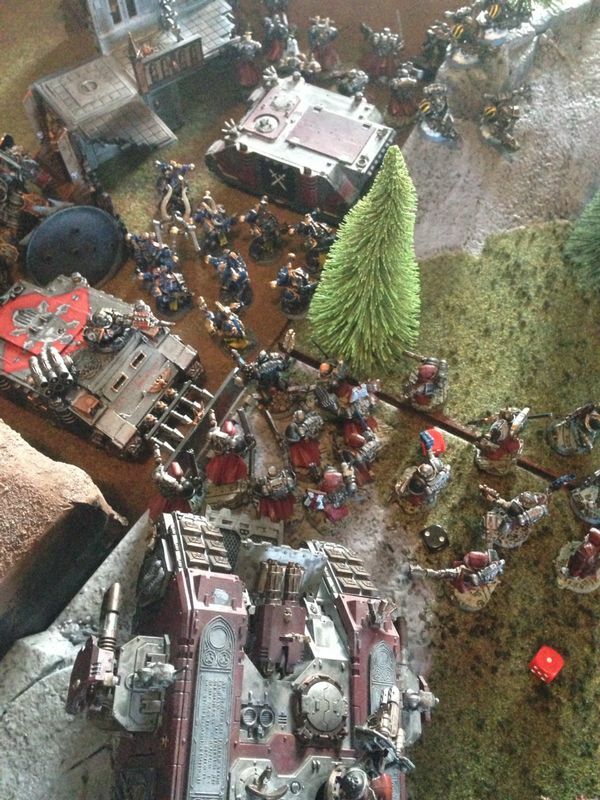 The cnnon and the bunker are now dedicated to the Iron Warriors Legion, 23rd Grand Battallion. If you find that the hazard stripes give you some trouble, go check my previous post on the Chaos Warhound dubbed ”Titan from the Warp” I explain how to paint hazard stripes very easily. You van apply them on anything of your liking and this way has helped me a lot. It may take a while but I am sure you will find the endresult most pleasing. So that’s it. Down here you will find the pictures of the Iron Redoubt. Go check them out, and next time I will be uploading the next parts of the board. Some of you might remember what I was working on a few months ago. 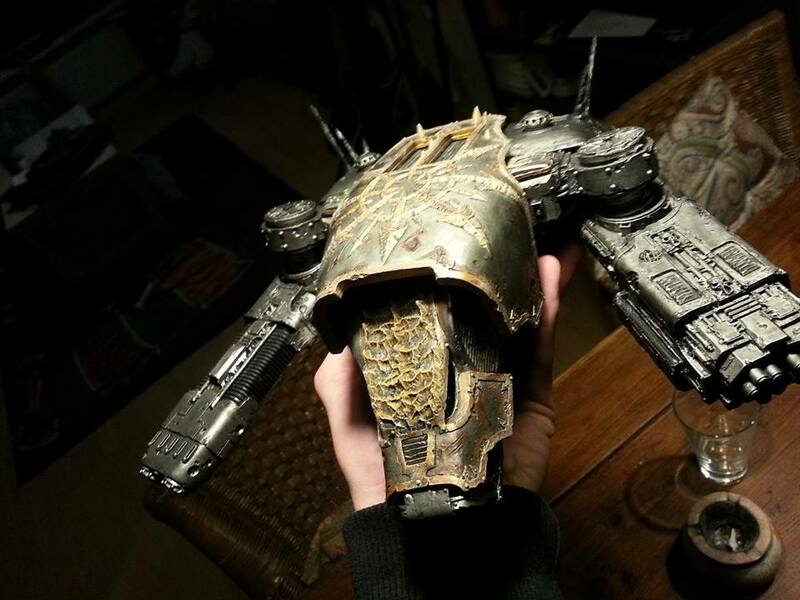 Now, as I was scrolling through my blog yesterday, I noticed that I still hadn’t uploaded pictures of my finished Warhound, called Abominatus Rex. Well, finished… the only thing left is the larger part of the interior of the main hull, but been so busy with too much, I’ve got too distracted to work on that. If that’s finished, pictures of it will, eventually, be uploaded. Anyway, here’s what I got. 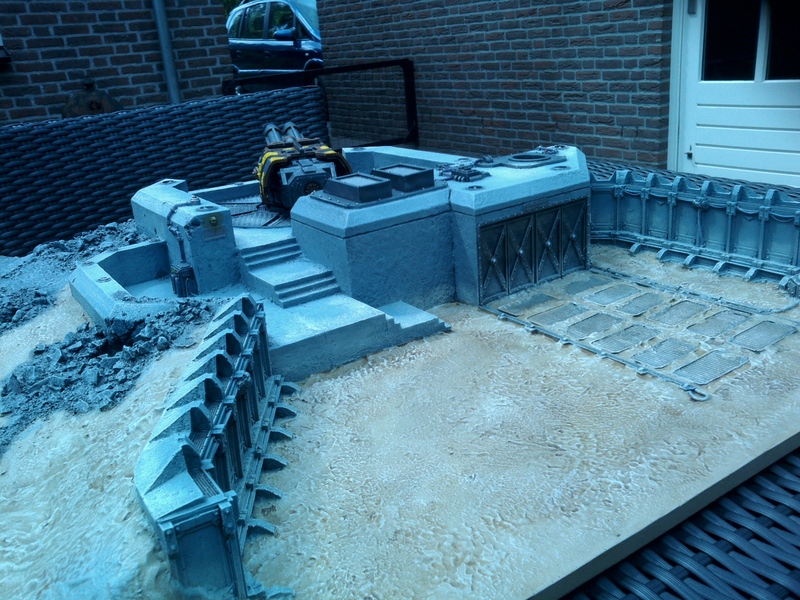 The entire model, outside the interior, is done and I’m very happy with the result. Had a blast woring on all the little details, from the oozing rust effects to the aged golden trims, and everything else on it. Especially the plasma reactor part on the blastgun was a challenge, because small plasma are fairly easy to paint well using washes and glazes. But with this, I really had to take it to an entire new level because of the size. Really put my effort on trying to create a decent form of energy lighting until I was happy with it. hope you like it, because I think it looks awesome. 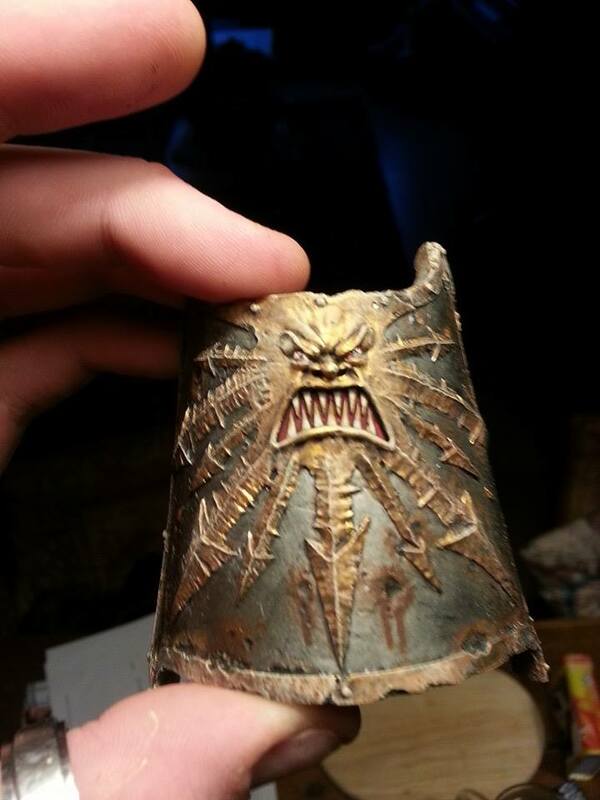 * Washed damage effects with Agrax Earthshade and Nuln Oil, then carefully painting the details within with Bubonic Brown, finally washing it again with Agrax Earthshade. * Added rust effects using, in order: Typhus Corrosion, Ryza Rust, Agrax Earthshade, AK Interactive’s Rust Effects. * Put a fair amount of Nul Oil wash into the air vents. * Stippling Yellow with Ak Interactive’s Rust Effects, when dryb, stipping with Leadbelcher, finally covering it again with a stipping of Rust Effects, to give it a rust and damage effect. 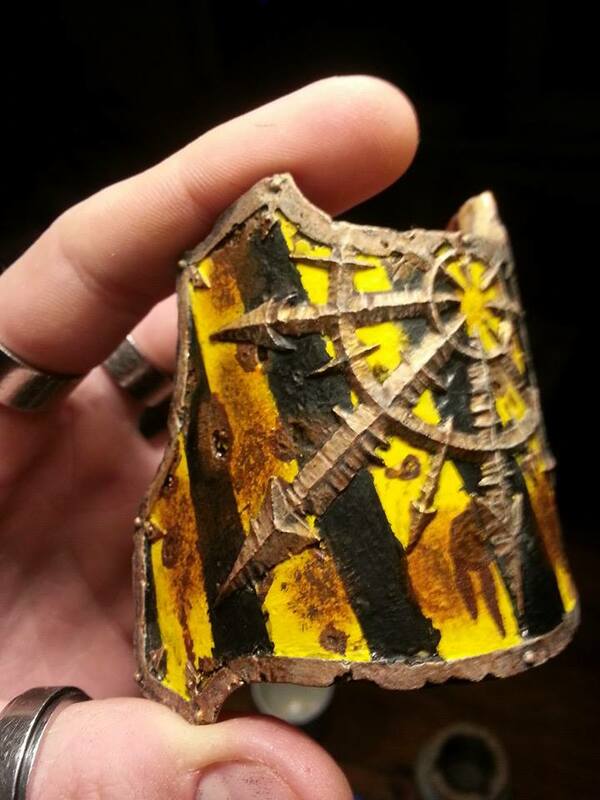 * Trim painted in Gehenna’s Gold, washed with Agrax Earthshade,with drybrush of Bleached Bone, like above. 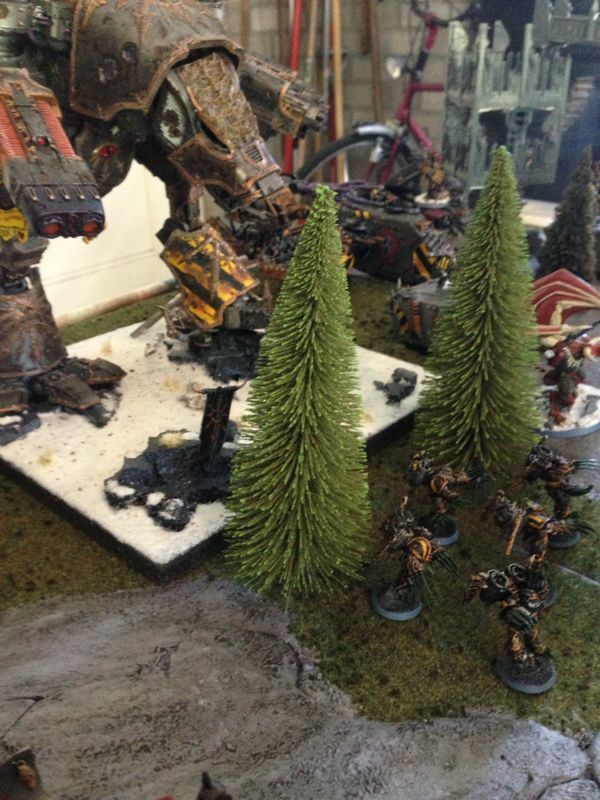 Hopefully you will find this helpful if you are thinking about painting your Iron Warriors models. I’ll keep you guys updated somewhere in the following days on how this project is going. In my last post, I talked about using a bolt and nut to locking the two seperate body parts of my Warhound Titan together. So here are the promised pictures of my progress so far. First, I took a drill (yes, an electric. Horrifying, isn’t it?) and made a hole in the body withing the joint where the legs part would fit in. I than took a nut and glued it in there. I had to push it in pretty hard, but I got it in. Next, I used superglue to glue it into place (hoping it will not fail me, ever) and using greenstuff, I sculpted a floor section on top of the nut, so it won’t be visible anymore inside the warhound. Than I made a ”pit” in the groin of the legs and put a bolt in it, filling the gaps underneath the bolt up, than using superglue I glued the bolt into place and then covered it up with Greenstuff, Now it’s just a mtatter of time until it’s hardened out fully. I do hope the greenstuff and the superglue are strong enough to suppert the weight, let alone the legs, because the torso is pretty heavy on itself. 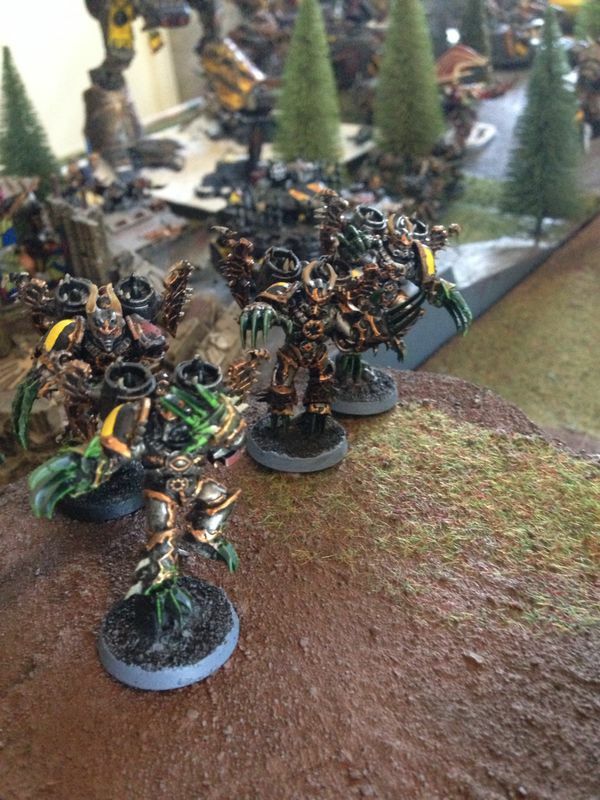 on the picture below, you can see the leg section of the Warhound with the bolt standing out of the groin. Yesterday, I received my Chaos Warhound Titan!! finally, after years of wishing for this model, but not having the money for it, I struck a deal at a buy/sell page. Got it for more than half of the original price. Guess I’m pretty lucky with that. Started right away with assembling the model. Everything is now built, with the exception of the torso-on-legs, the left leg-guard, the back and cockpit-cover, so I can basecoat it from within and without, plus the leg-guard will be basecoated in a white/grey colour because this is where the black-and-yellow hazard stripes will be painted on. the rest will be painted in a metal colour (mostly drybrushing it with leadbelcher) and golden trim. All the damaged places on the armour will be surrounded with blast-and-rust effects. But first, I have an idea for the base model. I will be putting a bolt in the belly of the torso and a nut in hte groin, so that I can ”screw” the two seperate body-parts together. In my next blog, I will upload some pictures to let you see my progress. Oh by the way, the greenish colour on the legs is a layer of liquid greenstuff the previous owner had already painted on the separate parts.